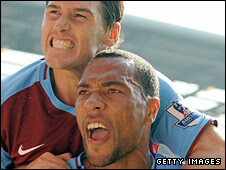 First-half goals from John Carew and Gabriel Agbonlahor gave Aston Villa victory in the West Midlands derby. Carew headed home Ashley Young's free-kick and Agbonlahor netted only a minute later after Leon Barnett failed to clear Young's long ball. James Morrison pulled a goal back for West Brom by pouncing to score after goalkeeper Brad Friedel spilled Robert Koren's 25-yard shot. Carew hit the post with a right-foot shot and a header in the second half. Albion, who have not beaten Villa since 1985, were forced to make a change to their starting line-up just before kick-off. Defender Abdoulaye Meite was named in the Baggies side having recovered from a calf problem but picked up another injury in the warm-up. Barnett started instead - and was at fault for both Villa goals. First, in the 27th minute, the former Luton centre-back failed to pick up Carew, whose header went in off the post. Then, under pressure from Carew, Barnett could only divert Young's long punt into the path of Agbonlahor, who raced past Jonas Olsson and fired into the bottom corner of the net. It was a tough first half for Albion, who lost winger Chris Brunt to injury before finding themselves two-down and in danger of being overrun. But they battled on and when Friedel was unable to hold Koren's effort, Morrison reacted quicker than Villa defender Nicky Shorey and netted his second goal of the season. Friedel atoned for his error by saving from Do-Heon Kim, who had come on for Brunt. Kim was picked out by Paul Robinson's cross but saw his close-range header brilliantly pushed away. That suggested West Brom would step up the pressure after the break, but Carew was twice denied by the woodwork after the restart. The Norwegian striker fired against the far post after latching on to Nigel Reo-Coker's clever pass. And the same post came to Albion's rescue again when Carew met Stilian Petrov's cross with a powerful header. 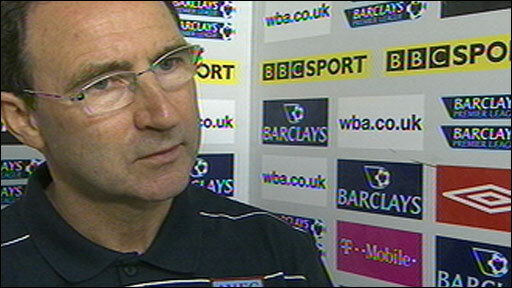 Albion boss Tony Mowbray responded by sending on strikers Luke Moore and Ishmael Miller. Former Villa man Moore shot wide after Gareth Barry failed to clear Jonathan Greening's cross, before Reo-Coker went close for Villa with a long-range effort keeper Scott Carson did well to keep out. The result is a bitter disappointment for West Brom's fans, who booed Villa's ex-Albion defender Curtis Davies throughout. Villa, on the other hand, were able to celebrate their third away win in six days as they moved into the top four. "They shouldn't be getting headers in our box. That was disappointing to see. "For 25 minutes we were in the ascendancy and looking the most threatening team, and then there were two goals the like of which we have to quickly stop conceding. "We've got to keep believing we're a decent team and as soon as we cut out the very poor goals we're conceding at the moment, we'll be fine." "It's a big relief to win the game and see it though. West Brom never gave up. 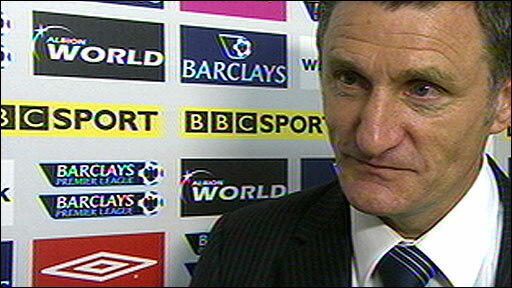 "I thought we played splendidly. It was our third away game in five-and-a-half days and to win it is magnificent. "Our goals game at really important times. We could have done with another one after half-time when we had a couple of great chances, but we were great." West Brom: Carson, Zuiverloon, Barnett, Olsson, Robinson, Borja Valero (Moore 56), Morrison, Koren, Greening, Brunt (Kim 20), Bednar (Miller 56). Subs Not Used: Kiely, Hoefkens, Cech, Donk. Booked: Morrision 36, Robinson 37, Valero 52. Aston Villa: Friedel, L Young, Davies, Laursen, Shorey (Milner 73), Reo-Coker, Petrov (Gardner 82), Barry, A Young, Carew (Cuellar 88), Agbonlahor. Subs Not Used: Guzan, Harewood, Knight, Salifou. Goals: Carew 27, Agnonlahor 28. Booked: L Young 67, Carew 75, A Young 87. BBC Sport Player Rater man of the match: Aston Villa's Gabriel Agbonlahor 8.07 (on 90 minutes).